We had heard from a couple different folks that the entrance to Chesapeake City on the Chesapeake and Delaware Canal had shoaled up a bit over the past two years since we were last in there. Thus, we were a little anxious about getting through the entrance, especially because our depth alarm had been screaming on our way in that last time. While coming up the Chesapeake yesterday, we decided to call the Chesapeake City dockmaster to get some local information about the shoaling. While I was at the helm, Margaret made the phone call. I could tell from her side of the conversation that it was a good thing we did as Margaret asked a number of questions and had the woman on the other end repeat herself a few times. 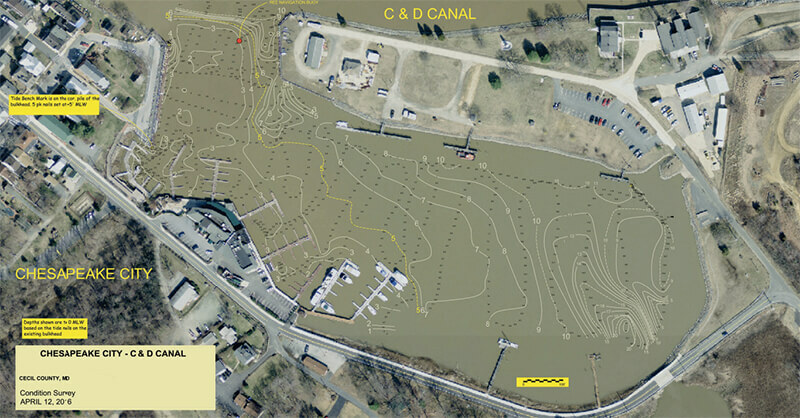 It turns out the shoaling is absolutely awful, leaving only a narrow entrance on the Delaware River side for boats with more than four or so feet of draft. 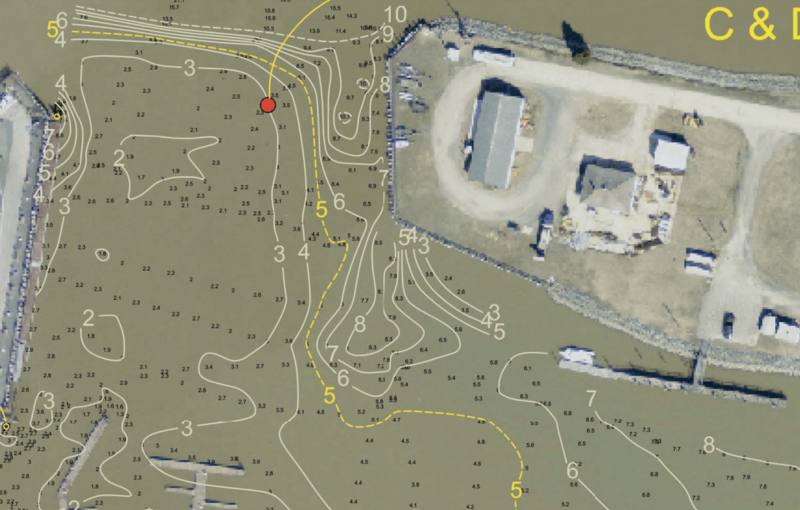 Fortunately, someone – it is not clear whether it was the Corps of Engineers, the town of Chesapeake City, or somebody else altogether – conducted a survey of the basin and entrance on April 12, 2016 and charted those depths. The chart proved invaluable as we came into the basin yesterday, but it was still an anxiety-ridden experience. Margaret went below to monitor the chartplotter and the depth sounder (our depth at the helm station was giving us trouble and we have chosen not to have a chartplotter at the helm, relying on paper charts instead). I had more or less memorized the pertinent parts of the new survey and had my plan as I helmed it in. The first wrinkle in my plan happened when the two knot current in the canal threatened to sweep us past the entrance entirely. I ended up coming in with a lot more speed than I wanted to and worried that we were going to be swept into the bulkhead to boot (you can hear us discussing this part of our entrance at the end of the video). But once we had passed fully entered the entrance, the current was not an issue. I put us in reverse for a moment to try to slow down as I kept the boat as close to the bulkhead as I dared; Margaret later said we looked to be well up on the land on the chartplotter. With Margaret nervously shouting out the ever-shrinking depth, I brought us even with the first inside dock and made a ninety degree left turn. Passing over the newly charted five foot area, we kept close to the first and second dock and then breathed a sigh of relief as the bottom fell away a bit. Once inside, the depths were comfortably in the double-digit range, and there were no boats anchored up, giving us the pick of the basin. We dropped the hook right in the middle and spent some time ensuring that the anchor was well set given the strong winds and swirling gusts that were present. In the end, Margaret never saw anything less than six and a half feet on the depthsounder, but it was an extremely high tide with the heavy winds piling a lot of water from the Chesapeake onto the already high tide. 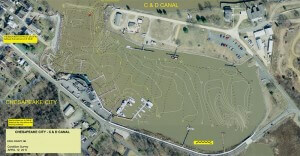 We saved our track on the chartplotter and will follow it out, hopefully with just as much success as we had coming in.